This trick is no secret. In fact it’s not even a trick. This simple compositional principle is deep rooted in our subconsciousness’ desire for simplicity and completeness. If something is too simple it’s not complete, if it’s too complex it’s not simple… the triangle has the envied position of being the simplest of all the polygons, after all it has the minimum number of lines required to ‘close’ the shape and promote it from a simple line to a polygon. Simple and complete, all rolled into a single entity. The triangle has hypnotized artists for thousands of years. But you already know all that crap. In fact, if you have read just a tiny bit about art or paid a little attention as you look at paintings by the masters (you do go to museums right?) then you know what I’m talking about. So why read it again? Because I’m more entertaining than your stupid art class, that’s why. It’s hard to believe that Leonardo Davinci painted the Mona Lisa over five HUNDRED years ago. What better example of the brilliant use of a single, prominent triangle to create a stunning and simple composition. But wait you say, “That’s not a triangle, all the corners are cropped out.” Well, guess what, an implied triangle is just as strong as an actual triangle… and if that doesn’t satisfy your naysaying read the evidence which suggests (and I believe) Leonardo’s masterpiece was originally larger, and probably included the entire shape. As the photographer you have ultimate control of what you show between the four edges of your frame, that is your kingdom to create whatever it is you want. Do you need manipulate your whole photo-taking existence around worshiping the triangle and putting one into every image? Absolutely not, but if you spot the opportunity to invite the serendipitous triangle into your images when the opportunity presents itself then I think it will give your work that extra, subtle blend of simplicity and completeness. I’m not really sure why these triangles exist, I didn’t really plan them. I think they are just part of a sub-conscious preference towards arranging subjects into triangles, or maybe it’s a sub-conscious attraction I have towards selecting these types of ‘happy accidents’ in the editing process. Whatever it is you’ve probably noticed that a lot of my images tend to feature prominent triangles, here are just a handful. All shot within the last 10 months. I’d love to read your comments and thoughts about why YOU think triangles improve composition, or if you disagree completely. Comment away! I have read that equilateral triangles the most compositionally noticeable to the subconscious, and when presented base down they give an impression of stability (and, conversely, when point down, give an impression of instability). I’ve also read that different kinds of triangles can be used to accentuate different aspects of the image, and in parentheses are images that act as memory aids (and examples). Very acute triangles, base down: majesty (a skyscraper flying up to the clouds); point down: speed & dynamism (a meteor falling to earth). Very obtuse triangles, base down: vastness, expansiveness (shooting from the middle of a road that goes off to the horizon); point down: security, safety (arms cradling a child). I’ve also read that generally people associate different feelings with color that can be used to power up a compositional element like a triangle. Some of the connotations we have about color seem to be innate: red -> blood, danger; blue -> possibility, coolness; green -> peace, serenity. Some of these connotations seem to be cultural: red in Eastern culture -> luck; purple & yellow in Western & Eastern cultures, respectively -> majesty, power. 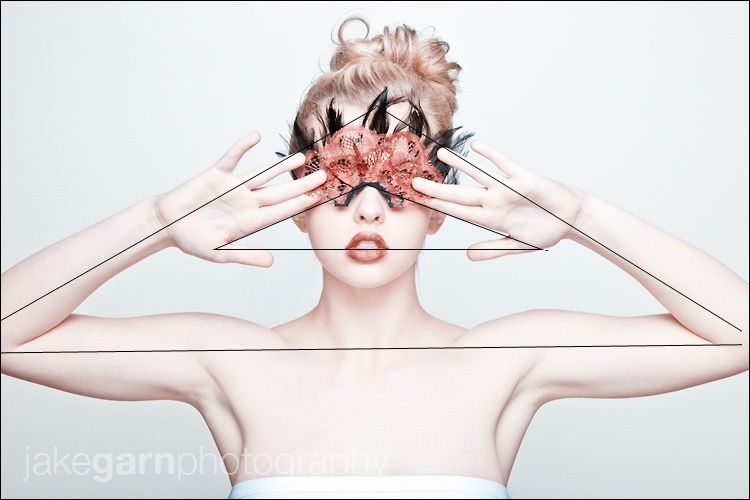 Interesting stuff, I really like your compositional posts, can’t wait to see the next one! Nice post .. great things to keep in mind! GREAT points Steven, thanks for sharing! Convincing post. Thanks for it. Really like your site layout, well written blog – will bookmark this! 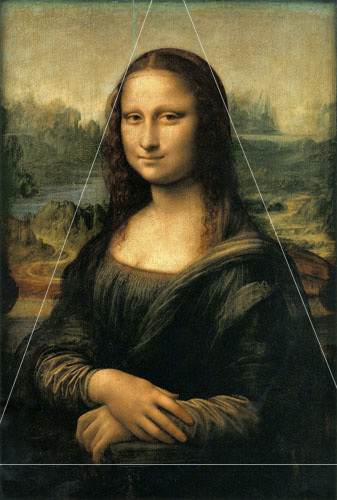 The Mona Lisa is an example of Da Vinci using the Golden Rectangle rather than a triangle to place emphasis and balance. He was a mathematician and used rectangular shapes frequently in his Art. which is best HDR sodtware ude in our laptop pls give a sport for me…. Thanks for your article, it was an interesting read. One thing that I wonder is whether we convince ourselves of the importance of triangles? Because of the fact that triangles can be irregular in shape, we can create them out of almost any part of our image, as long as there is something on which to base the corner; often this is a very subtle something. I wonder then if triangles are as important as we often give them credit, but are instead just something we have decided to see? A superstition almost: “oh, that is a nice image, look, there are triangles in it – triangles must make a nice image”. I don’t know whether it is the case, but chicken and egg comes to mind. It is very difficult to say because triangles are there. However, I wonder if they actually hold relevance; are there other compositional processes going on that create a pleasing image, that we accredit to triangles, because they are easy for us to make. Freddie.